Showing results for tags 'arcanites'. 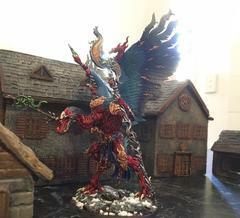 Recently finished off this fella, I've dubbed him *the angry parrot* Apologies about the glare from the sunlight. I’ve started working on a large Tzeentch Arcanites force, and I’m using this plog as a way of keeping me regularly motivated. The background for my army is fairly simple: my force belongs to The Children of X’enthos, a splinter cult of the Transient Form. Their previous Lord Of Change, X’enthos, was killed in Ulgu by Festis the Rotborn, a Nurgle lord, but his bones are kept in the cults lair. As a ritual, all of the cult wear armour carved from his titanic bones, and, staying true to the Transient Form, believe that becoming a Tzaangor is the purest way of worshipping Tzeentch. Their colour scheme is purple skin for the Tzaangors and bone armour for everything. My spot colours are dark red and brilliant green. Will get some photos in quickly?? I’ve bitten off a way bigger project than I can chew and am working on a large force of Tzeentch models, between Slaves to Darkness, Daemons and Arcanites. While I work on assembly (which takes me forever thanks to being a perfectionist with mold lines, gaps, subassemblies and separate basing on some models), I’m practicing my paint schemes with some models off of eBay. 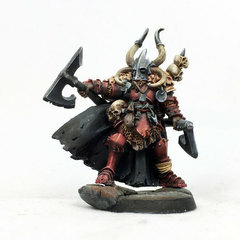 So far that’s meant this Kairic Acolyte- I’d love C&C from anyone working on a similar army, or in general, as I puzzle outhoe to replicate the GW studio scheme (which coincidentally fits my favorite fluff from the Battletome, the mutation-obsessed Cult of the Transient Form). People on the AoS subreddit night have already seen this; I have a short list of problem areas I know how to do differently and some things I’m still working on: 1. The cloth: I need to do a recess shade after the initial layer of Celestra Grey instead of layering up to Ulthuan Grey and thinking I can clean up an all-over wash. 2. The skin: this is Rakarth Flesh, all-over Reikland Fleshshade, Flayed One Flesh layer. For the next one, I think I’ll get better, less stark results by layering up to Flayed One first, washing with thinned Reikland and then layering Flayed One again and Pallid Wych Flesh for highlights, but I’m totally open to feedback and suggestions. 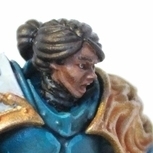 For full units (and at least one of my three remaining eBay practice models) i want to mix in darker skin tones as well. 3. The gold. It’s too bright on the mask; the shield is shaded but not layered yet. I start with Retributor Armor and Reikland Fleshshade (washed at the same time as the skin) but a layer of Liberator Gold is too bright and silvery. I’m going to try a layer of Auric Armor Gold, leaving Liberator for highlights and Stormhost Silver for fine points, though I’m a little worried that might look too much like the Stormcast color scheme... 4. The visible mutations, in this case the mask and feet. I’m a little annoyed that the multipart Acolytes don’t have bird feet and from what I can tell the masks don’t seem melded into their faces like on this guy but rather just seated on top, with flesh visible around the eyes on some, but I’ll figure out how I want to make it work. This is just a wash of Carroburg Crimson, which left some unfortunate tide marks and uneven finish on the applied areas. 5. Finally, and his is just personal preference, the gems. 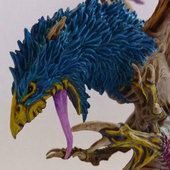 I’m not really sold on the gemstone paints, and this model (and the Tzeentch range!) has enough uneven shapes, like the “eyes” on the belt and dagger hilt, to make the gem paints physically difficult to apply. And the metallic finish makes it that much more difficult to paint a pupil on the “eye” gems and have it be legible. I’m going to try the old school approach on future models and see where that gets me. First test unit completed, there is so much fine detail on these things it makes it painful on the eyes to paint, but they are such magnificent minis. Time for another character for my chaos army. This one nicely blurs the line between sorcerer and beastman,,, The Ogroid Thaumaturge! Mainstay of The Silver Tower and Tzeentch Arcanites (he wouldn't look bad as the magic support in a Warherd army either...) I was quite happy with the wet blending on his skin, although I could quite happily never have to paint another one of his eldritch sigils. I'm not sure how I feel about his 'looking over the shoulder' pose. It's nice to have a different sculpt to 'looking straight ahead', but there doesn't seem to be a single, best angle to view him from (hence all the photos), and I think he works best in three-dimensions. He's off to command a mixed Chaos force in a five-game tournament this weekend, so I hope his sigils are fully-charged! Tzaangor kits are a pleasure. Yesterday I started to assemble my box set of Tzaangors. This 10 model kit is really something. Every part is interchangeable. It is fairly easy to build your great weapon builds, your mutants, your twistbrays with great weapons. Different heads, tentacles, arm poses all come together. If you read my earlier blog entries you will see what a mixed unit weapons wise this unit will be and mine unit will be 30. Can't wait to put them all together! This unit is going to be sick! So I have been giving a lot of thought to the guts of my Disciples of Tzeentch army. I am going to start by using Tzaangors for this. Unit of 30- 540 points. Tzaangor Shaman-120 points. 1- Twistbray with Shield Thinking about giving him a great blade. 1- Icon bearer 1- Brayhorn with Shield 6- Muntants paired savage blades. 12- Great blades 9- Savage blade/ Arcanite shield. Would you change anything on this make up? Greetings all.  First time blogger here. Been doing minis since the 70's. Then last year was very exited about AOS. I am a servant of Chaos and the gods I pray to are Khorne, and Tzeentch. I also have a good start on a Slave to Darkness army that will all have the Mark of Tzeentch. Currently I am building a very heavy Tzaangor list and here is my first pic. Going to be sharing my thoughts on this army construction all the way to 2000 points. I wanted to do something a little different with my Balewind Vortex to tie it into my Gaunt Summoner. He seemed like the type of guy to surf a screaming column of space magic, y'know? Hi everyone. Warhammer Quest Silver Tower has brought me back to the hobby after many years. In the past I have been a Chaos collector (and occasional player), though my first love were the lizards (which is the last time I seriously tried painting). Since then it has been Cult of Slaanesh, Chaos Daemons and Skaven, though all largely unpainted. So here's my first batch painted, and its Tzeentch Daemons + Arcanites vs a lone warpriest and his hound. Someone's not making it home tonight! Apologies for the poor photography.